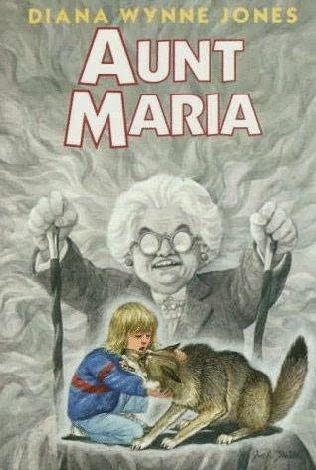 I hope that a few of you got the chance to read Aunt Maria (also known as Black Maria). If you wrote up some thoughts elsewhere, please leave us a link in the comments so that we can visit and comment! This was my third reading of this book. The first time, I thought it was really dark and a bit confusing and wasn't sure I liked it. The second read was much better and this third was on par with that but maybe even a bit better. I was happy with the pacing and thought there was just a bit of a rush toward the end but not as bad as with some other DWJ stories. And I really liked the characters, especially Chris and Mrs. Phelps. I disliked Elaine much more this time than I think I ever did before but I'll have to think more about why. How is Mig's mother different than usual DWJ parents? How is she the same? What do you think of "women's magic" being the power to talk/convince/guilt trip? How creeped out were you by the orphanage? Why did Mig only ever do one bit of magic (calling up Antony Green)? Would you have been able to take Lavinia the cat home as a pet? We have a scheduled Twitter chat on Saturday (date edit: 14 March). If you have any questions, thoughts, etc. that you want to throw out there about Aunt Maria and you are a Twitter user, join in! I'm not going to set a time for this one because I'll have an out-of-town visitor that day so I can't commit to a particular time. 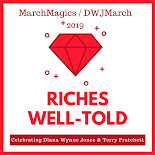 I'll check the #dwjmarch hashtag throughout the day so be sure and use it! What time is the discussion on Saturday? I probably have to be at a thing with my kid, but I'll try. Great questions here, I will post my thoughts soon!